We don't always know that we have options. Life is more complicated than it was a few decades ago, so keep that in mind when dealing with younger clients. There's a lot you might not be considering about their situations. We want to work with agents. You all are the experts! Millennials are often painted as the housing market’s scaredy-cats, scarred in their formative years by the housing meltdown and leery of adding mortgages to already-bloated debt loads. So it would be natural for many agents to choose to invest minimal time and effort in trying to tap these young ‘uns for business. But I’m here to tell that that would be a mistake. Millennials can be a rich business opportunity for agents. You just have to understand us. Hi! My name is Amber, I was born in 1981 — so I’m technically a millennial, I suppose — and I haven’t bought a home yet. There’s always plenty of news about millennials and housing on any given day in the real estate industry, but this week, three generation-related pieces of news caught my attention. What’s my problem? What’s our problem? Here are some things you should know. 1. We don’t always know that we have options. I probably could have bought a place of my own years ago. I thought I needed to pay down more of my student loans. I thought I needed to save more. I thought I needed a better job. I made all kinds of assumptions that were, in retrospect, totally off-base. Now that I’m actually talking to a loan officer, I’m realizing how much sooner I could have taken this step. I had no idea what the black-and-white numbers would be — and I didn’t bother finding out because I was certain that any research I did would be time wasted. What does this mean for agents? Help your potential clients — especially millennials — assess their financial situations and make an educated decision. If I’d had an agent approach me years ago and tell me, “For this amount a month and this much down, you could be living here,” I might be writing this article about buying a second home instead of a first. Also, consider directing us to Down Payment Resource. I had no clue that there are at least 2,300 down payment assistance programs. Seriously?! 2. Roommates can be a step on the path to homeownership. When I learned my rent was going to increase beyond my budget this past March, I had three choices: I could find another place to rent (and potentially face the same problem again soon); I could buy a place in a hurry that likely wouldn’t be a great fit for my household; or I could take up a close friend’s offer to move in, save more money for a down payment and take my time with my home search. I picked door no. 3. And it’s fascinating that none of the stories about older potential buyers who live with friends or family seem to consider that it might be a stepping stone on the path to homeownership — because that’s exactly what it is in my case. What does this mean for agents? Don’t discount millennials living with roommates as potential clients. It’s frankly not true that they’re not ready to buy — they might actually be working toward that very eventuality, and you could help them get there. 3. When certain social services are cut, family picks up the slack — and that has consequences for homeownership. It’s about to get heavy. I warned you. Since the 1950s, the United States has been experimenting with how it deals with mentally ill citizens. You might have heard the term “deinstitutionalization” (here’s a wonderful PBS article about the topic). Lately, there’s a lot of talk about how our treatment of mental health affects mass-shooting crimes, but when someone isn’t a direct threat to society — yet is still severely mentally ill — what do you do with that person? The answer is essentially “nothing.” The institutions that still exist to deal with mental health are utterly overwhelmed, so they focus primarily on people who are an immediate danger to themselves or others. And that “immediate danger” threshold is much higher than most of us would like to believe. I have a family member with a mental illness. When he’s in treatment and on medication, he’s a joy to be around. When he’s not, life in general becomes challenging. I won’t go into the specifics of his situation, but I will say that I’m one of the only people he trusts when he’s delusional, and that for a couple of years, I was essentially his caseworker. I monitored his appointments and set him up with health insurance and did all of the things he needed done but that he couldn’t do himself. If you’ve never been in that situation, then it’s hard to imagine the time and resources it requires. There isn’t a robust social safety net for people like my loved one anymore, and he could very easily slip through the holes in that net. So if I want to make sure he isn’t homeless and hungry, it’s up to me — no one is helping me. If you’re in a similar situation, you already know about some of the unexpected expenditures — bailing people out of jail and dealing with ER bills, to name just two. When you’re faced with a choice between springing your loved one from a cell (when he was put there for something he didn’t realize he was doing) and saving money for a down payment, the down payment isn’t typically the winner. What does this mean for agents? Simply understanding that this can be an issue for some potential buyers is important. It’s obviously not something that every prospect or client will disclose, and it’s a good argument for keeping an open mind. You never know what your clients are dealing with personally unless they tell you, so instead of writing that prospect off as a flake or wondering why they “ghosted” you, consider that there might be a lot happening beneath the surface that’s invisible to you. 4. We want to work with agents. 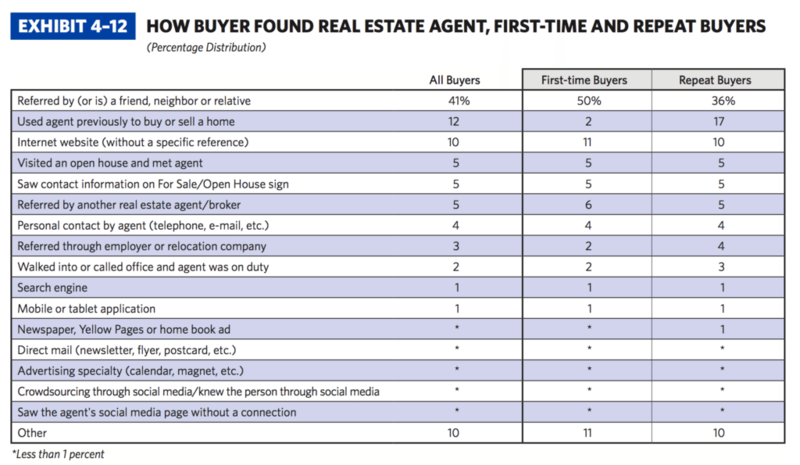 One big finding from NAR’s research is that an overwhelming majority of survey respondents — 87 percent — said they used an agent or broker to help purchase their home. I think this could be evidence that the do-it-yourself mentality is beginning to take a backseat to a hire-an-expert philosophy. Sure, I could probably secure a loan on my own, find a house, make an offer and deal with the transaction minutiae if the offer is accepted. But this is an important purchase. Even though I could do all of that myself, I am too nervous that I’d miss something important or that I’d make a mistake. I could also change my own oil and fix minor repairs on my car if I were so inclined. But instead I take it to a mechanic — because I don’t have time and my mechanic is the expert. He knows my car inside and out. And I trust him. I don’t necessarily need an expert to walk me through this process. But I want one. I’m more than willing to pay that expert a flat rate or a commission fee — and if I do my due diligence in selecting an agent whom I trust, then I can trust that the agent I’ve selected deserves every penny of that payment. What does this mean for agents? This is hardly news, but trust is vital. Personally, I’m not looking at agent reviews or searching online; I’m soliciting recommendations from friends, instead. That’s how I found the loan officer, who’s an absolute gem, and that’s how I hope to find my agent, too. Half of first-time buyers apparently take the same approach (see below), compared to 36 percent of repeat buyers. It’s well worth your time to cultivate referral relationships. Don’t give up on millennial buyers. Our situations are often more complex and nuanced than in previous decades — but that doesn’t mean we’ve given up on the dream of homeownership. Some of us are already on the path; we just need better guidance.